If you throw peanuts, you will get monkeys! Now, that is my version of the famous idiom. Except that mine is far more literal than profound. I am famous for taking shortcuts wherever I can, except when I drive. Then I take the longest and safest route, sometimes even the wrong route. But never mind that. Peanuts find their place in everyday cooking in my home. 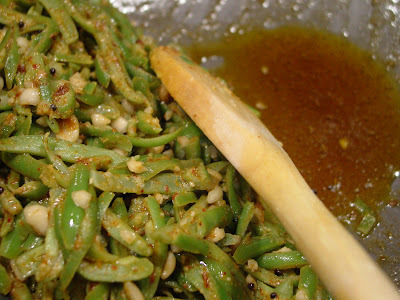 I toss them in salads (gajjarachi koshimbir), in dals, in veggies. Some might say that I am smart and that I do it for the additional protein but the real reason is that we just like peanuts a lot! The added benefit is a bonus! One such shortcut is dry-roasting of peanuts in the microwave. I put them on a large plate in a single layer and zap them for one minute. I let them cool a bit and then zap them again for another minute. I skin the peanuts once they have cooled completely. Well, I used to. Now, that the monkeys in the family smell the peanuts cooking, they arrive automagically in the kitchen; one perches on the stool to get a good vantage point, the other fills a glass of red wine in anticipation. They then address the peanuts and skin them for me. The first time I was very elated that I had voluntary help. But that soon turned to dismay when I realized that I was left with only a third of what I needed. For every peanut that was skinned and left for me, two were tucked away into the cheeks of the monkeys. So now I make three times as much as I need and everyone is happy! Last week, I was at it again. By force of habit, I cooked three times as many. But only one monkey showed up. I substituted for the missing primate and we skinned the peanuts in silence, missing him. Me, even more, at the thought of the growing piles of snow and how I would have to go out to shovel again. "What if he doesn't come back, Mumma?" She has been a near wreck since he left on New Year's Day. Every evening we suffer through: Are the doors locked? What was that sound? Did you shut the garage? Is that gas I smell? It's almost like I don't count when it comes to physical security! I'm quite used to this and I make sure she feels safe, especially after dark. But this latest question took me by complete surprise. "He loves us very much. We are his family and his home. He will come back. He told you a little while ago how much he misses you, so what makes you think he may not come back?" After much shifting from one foot to another, she said: "Remember Mohan from Swades? He didn't come back. What if Daddy does not come back either?" Ah! One more reason to hate SRK! I held her close and explained the difference between Mohan in the movie and her beloved Daddy. Yes, he loves his India and has many ideas in his head about what he can do to give back; and, yes, we have strong family ties there, but no matter what happens, we are an integral part of him and he will be back soon. She sensed that I spoke from the heart with a lot of conviction and soon went back to filling her cheeks with peanuts. 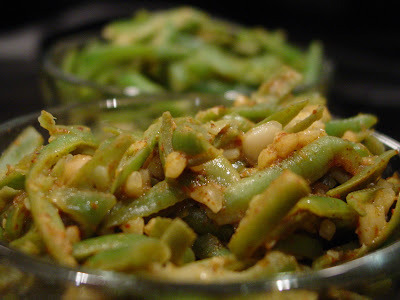 And after exchanging some more wonderful cuddly body-warmth, I went back to cooking my Nutty Green Beans, her favorite veggie dish for the moment. This is a very quick and easy way to make beans. I prefer to use fresh beans but when fewer trucks come in with limited fresh produce, I use frozen beans. Chopped green beans always taste the best but when you’re in a rush, like I always am, french-cut beans seem better as they cook faster. I use a very Maharashtrian masala in these beans called Kanda Lassun Masala (Onion Garlic masala), which evokes all the pleasant memories of Bombay. 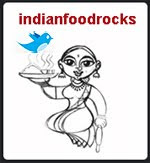 It's available in the Indian grocery stores from brands like Pravin Masalewale, Ke-Pra and recently, Ethnic Kitchens. I have a bias for the Ethnic Kitchens brand. 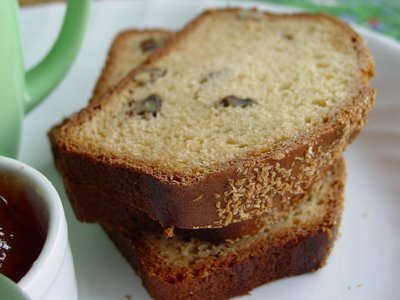 Lee, this post and recipe is especially for you! Dry roast the peanuts in the microwave as I do or in the oven or on a saucepan till cooked. Pound these into a coarse powder using your mortar and pestle. Heat oil in a kadhai on medium heat. Add mustard seeds and when they pop and crackle, add asafetida. 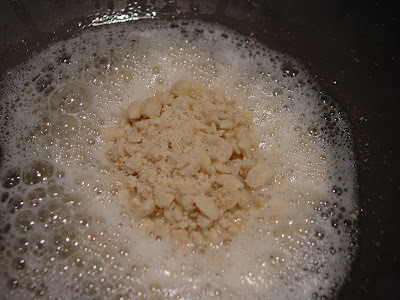 Add the coarsely ground peanuts. The oil will start bubbling at this point. Don't worry, just stir it till it settles down. Add the beans and stir. Add the Kanda Lassun Masala and very little sea salt. Kanda Lassun Masala usually has salt, so it's better to go easy on the sea salt as it can be added later. Turn the heat to high and stir-fry for a few minutes, making sure that every bean gets a nice coating of the spices. Turn the heat down and let the beans cook some more but don’t overcook them. They should have some crunch to them. 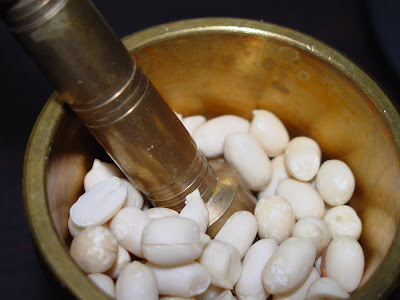 Since these beans use more oil than I would like to use, I drain as much oil as possible by placing the kadhai at an angle on the stovetop and collecting the beans to one side. Use a paper-towel to absorb all the excess oil. If you're comfortable with the amount of oil in the dish, you can skip this step. It's just something I do. Add a dash of lemon juice, garnish with some chopped cilantro if you have on hand and serve hot with rotis. 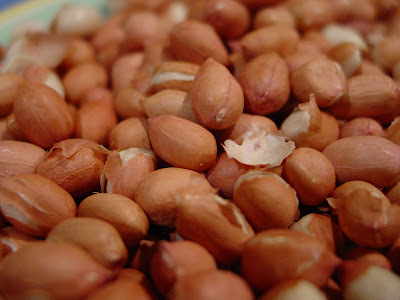 Avoid using Planters peanuts or any other ready-to-eat peanuts in Indian cooking. They are usually salted and also have an odor that takes away from the intrinsic flavors of the dish. You could use your spice grinder / blender / food processor to powder the peanuts. Ensure that you do not make a fine powder. 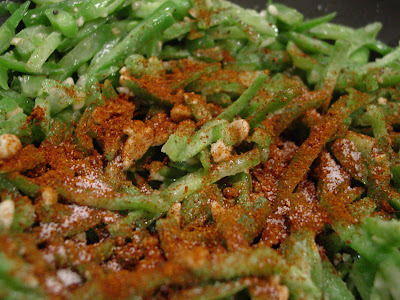 These beans need a coarse powder with some large pieces of peanuts; it makes the texture of this dish more interesting. French cut beans cook faster. Chopped beans taste better! Take your pick. To make it kid-friendly, I usually add 2 tsp of Kanda Lassun Masala instead of 3-4 tsp. I finish cooking the beans and take some out for Medha in a small bowl and then add a couple more teaspoons of the masala to give it that zing that we like so much! I also use a lot of lemon juice as it balances the heat of the Kanda Lassun Masala very well! If you don't have Kanda Lassun Masala, you could use 1 large clove of finely chopped garlic and 2-3 tsp of any garam masala you have on hand. If your garam masala is mild, you could add some red chilli powder to up the heat. 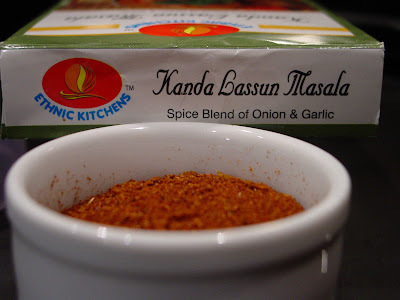 Kanda Lassun Masala from Ethnic Kitchens has the following ingredients: dried red chilli, onion, coriander, garlic, ginger, edible oil, turmeric and salt. Try it and let me know if you enjoy it as much as we do! To everyone who asked about us through these last couple of storms: Thank you! We are fine! Before he left for India, my husband got up on a very icy roof and wrapped tarp around the defunct chimney that had snow blown into it. It was awful watching him do that! But that fixed the problem of the leaky roof. Since then, Louisville has picked up between 10-11 inches in the first week of January itself. There was a ground blizzard soon thereafter due to high winds. It was very difficult to walk even a few yards in that storm and the snow that was flung in our faces really hurt. The fourth storm which started this past Thursday hasn't brought much precipitation but it has been really really cold. It was 0F with windchills in the teens below when I dropped Medha off at school on Friday morning. It has warmed up considerably and we are currently at 18F with another inch of snow on the ground. We are very lucky to be in a neighborhood where we can rely on our neighbors for help at any time of the day or night! I make sure I have enough food to last us a while and that the cars are fuelled up, too. It helps to have a gas stove and a water heater that has no electrical connections. So when there is a power outage, I can still cook and have warm water. Having a gas furnace doesn't help much as an electric motor pushes the hot air through the ducts - that's when I miss having a fireplace! To those of you in the states affected by the ice storm: Keep candles, matches, and flashlights handy. Make sure your blankets and warm clothes are easily accessible. Dress in layers and please move to a shelter instead of attempting to brave it out against the elements! Stay warm and stay safe through this rough weather!